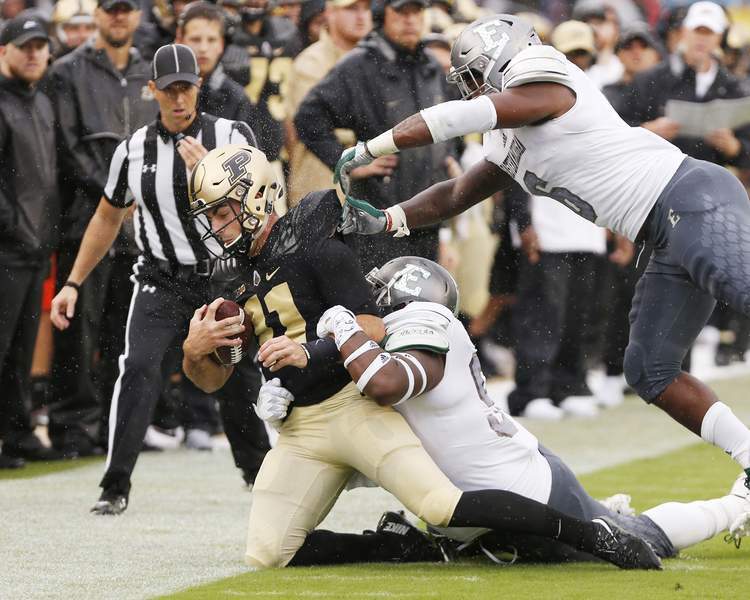 WEST LAFAYETTE – In rainy, sloppy conditions, more undisciplined, sloppy play brought down the wrath of Purdue coach Jeff Brohm on his team. Eastern Michigan freshman kicker Chad Ryland made the late go-ahead field goal from 24 yards as time expired Saturday to lift the Eagles over the Boilermakers 20-19 at Ross-Ade Stadium. On the final drive of the game, Eastern Michigan quarterback Tyler Wiegers was sacked on third down by Purdue linebacker Cornel Jones, who was called for a late hit when he appeared to shove Wiegers into the playing field while getting up after the play. Wiegers was 20 of 28 for 312 yards and a touchdown pass that came in the second quarter from 75 yards to Mathew Sexton to put the Eagles ahead 7-3. Blake Banham finished with six receptions for 99 yards and Jackson had six receptions for 84 yards for the Eagles of the Mid-American Conference, who have won two straight. The Boilermakers (0-2, 0-1 Big Ten) took a 19-17 lead after D.J. Knox's 45-yard touchdown run with 6:41 remaining. Knox finished with career-high 152 yards rushing on 21 carries and Markell Jones had 109 yards rushing on 12 carries. Brohm has made a point to keep quiet about who will start at quarterback for the Boilermakers the first two weeks. Sindelar started in Purdue's 31-27 loss to Northwestern on Aug. 31 and was replaced by Blough after throwing a third interception in the first half. Against Eastern Michigan, it was Blough who started under center before Sindelar entered the game in the second quarter. The Eagles mixed things up, too. Wiegers started for the second straight week and split time with Mike Glass III. It was just the third meeting between the two teams and first win in the series for Eastern Michigan. It was also the first time coaching at Purdue's Ross-Ade Stadium for Creighton, though he's more than familiar with the area. From 2001-07 he served as the head coach at Division III Wabash College located 45 minutes south of West Lafayette in Crawfordsville.